You would never know by watching the trailers or scrolling through stills, but Cloud Atlas is the most expensive independent film ever made. When you think of indie films, you generally don’t think of big budgets, jaw dropping visuals, and A-list actors like Tom Hanks and Halle Berry. But then again, you generally don’t have the directors of The Matrix behind them either. All of these elements are exactly what you get, in a film that transcends time through six generations that are all connected. Just like the 2004 novel written by David Mitchell, Cloud Atlas consists of six interweaving mini-stories spanning across different continents. The story starts out on the Pacific ocean, following the journal of Adam Ewing (Jim Sturgess) in the mid-1800s – shipwrecked while travelling back home from the gold rush. We are then taken to 1930’s Belgium where a starving musician Robert Frobisher (Ben Whishaw) takes a job helping a once famous composer Vyvyan Ayrs, where he finds Ewing’s journal. Frobisher’s story is told by letters written to his companion back home, Rufus Sixsmith (James D’Arcy), who is a key component of the next story revolving around a nuclear scandal uncovered by Luisa Rey (Halle Berry) in the 1970s. A manuscript for this story is sent in the early 2000s to publisher Timothy Cavendish (Jim Broadbent) in England, not long before he is sent to a nursing home against his will by his older brother Denholme (Hugh Grant). Later a film would be made about his misadventures, and viewed by a genetically cloned waitress named Sonmi 451 (Doona Bae) in Neo Seoul – formerly Korea – in the year 2144. Sonmi would eventually become some sort of god or idol in post-apocalyptic Hawaii, in a time period known as “after the fall.” It is there and then that Zachry (Tom Hanks) views her recordings on a futuristic device operated by Meronym (Halle Berry). The film is nearly three hours long, and there is a lot to take in, so don’t feel bad if you have trouble following the story-line by reading this review or watching the trailers. It is almost impossible to understand the film’s plot without having read the book or seeing it for yourself. But if there is one thing I am confident of, it is one of the most intriguing films I have seen all year. The way the stories are intertwined, sharing actors and slight similarities, is so different than what we are used to seeing in a film. Watching the film reminded me of the first time I saw The Matrix, which also housed the same feeling of creativity and originality. 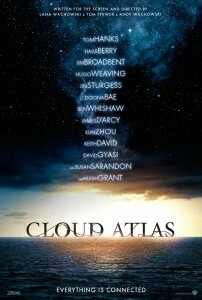 Cloud Atlas is both visually and technically very impressive. When I learned that the film was shot on a $100 million budget, I was in awe. On one hand, that is a pretty massive budget for a film – especially one labeled as independent. But when you look at other films that share the same type of epic feel to them, they are mostly blockbusters that range anywhere from $150 to $300 million. With the amount of well known actors in the film, along with the stunning special effects, costumes and sets, it is incredible that they were able to pull it off for that much in my opinion. And the result is worth every penny. The casting for the film is superb. Tom Hanks and Halle Berry stand out as the two leads of the film, but most of the main actors play a part in each story line. Hanks does an incredible job playing multiple substantial roles throughout the film, while never appearing to play the same part. You never sit there and think that he is just playing “Tom Hanks” like in so many other films. Jim Sturgess also plays a couple of major roles throughout the film, the favorite of mine being in the Neo Seoul story. The make-up is so impressive that you can hardly tell it is him, and his character – a rebel agent who is not to be reckoned with – is simply awesome. I really enjoyed his chemistry with Doona Bae in that one as well. Another honorable mention goes to Hugo Weaving as hit-man Bill Smoke, and the more comical Nurse Noakes in the Timothy Cavendish story. Jim Broadbent is hilarious in that one too, which does a great job of breaking up the film with lighter moments. I also enjoyed watching Ben Whishaw as the cunning con-man of sorts Robert Frobisher. Even though he is deceitful, there is something about him that you just can’t help but to like. There are just too many good things to say about the cast here, so it is best to let the film speak for itself. I really enjoyed listening to the soundtrack, both during and after the film. Several songs revolve around the “Cloud Atlas Sextet,” the song that Robert Frobisher composes while working as an amanuensis for Vyvyan Ayrs. The song is a beautiful one, and fits perfectly with the movie wherever it shows up. Author David Mitchell took the title from a piece of music written by Yoko Ono’s ex-husband Toshi Ichiyanagi. He found it fitting for the story because clouds are constantly changing, where an atlas remains the same. Although I can’t say that Cloud Atlas is the absolute best film of 2012, I can without a doubt say that it is one of the best by far. The story is beautifully told throughout the different short films, which are all spliced together in a way that leaves things feeling very fulfilling. There are many existential themes that you can take away from the film like reincarnation, and souls that travel from one lifetime to another. There is a lot going on, and it can get quite deep if you let it. But there is never a time that it feels too preachy or self-righteousness, which is a huge positive. Everything from the cinematography and make-up to the acting and storytelling is phenomenal, and gives the feeling of grandeur. In telling six completely different types of stories, there is something in the film for everyone, and the directors pulled it off marvelously. Cloud Atlas is an A.